Margaret Atheling was born of the ancient Saxon House of Wessex, she was the daughter of Edward Atheling, otherwise known as 'Edward the Exile' and Agatha (possibly a niece of Henry III, Emperor of Germany) and was born in Hungary in 1046. Her father was the eldest son of Edmund II known as 'Ironside', and grandson of Ethelred II 'the Redeless'. Edmund reigned briefly as King of England from April to November of 1016. After his father's death, and the accession to the English throne of the Danish King Canute, the young Edward and his brother Edmund were consigned to the safe-keeping of Canute's half-brother and ally, Olof King of Sweden. They were secretly sent to Kiev, where Olof's daughter Ingigerd was the Queen. They were then sent on to Hungary, probably in the retinue of Ingigerd's son-in-law, King András. The two children were placed under the care of the King of Hungary. The younger son, Edmund, died without issue. The elder brother, Edward, referred to as 'the Atheling' (Anglo-Saxon, meaning Prince or of noble birth), married Agatha, who according to some sources, was possibly a niece of Henry III, Emperor of Germany, the couple had three children. Besides Margaret the marriage produced a son, Edgar Atheling and a further daughter, Christina. Margaret returned to England with her parents and siblings towards the end of the reign of her great-uncle, Edward the Confessor , with a view to naming her father as his heir, fate however, intervened, and Edward Atheling died within months of his return to his native land. The Confessor took his nephew's grieving widow and children into his care and protection. After the Norman Conquest, the claims of the royal Saxon House devolved upon Margaret's brother, Edgar Atheling, but then aged about 13 or 14, but he submitted to the formidable William the Conqueror. In 1068, Edgar Atheling joined in rebellion with the northern Earls Edwin and Morcar against William's rule and shortly after the family were forced to flee, their ship was driven by storms to the Scottish coast, were they were welcomed at the court of King Malcolm Canmore. The spot where Margaret and her family are said to have landed, near North Queensferry, is still known as St Margaret's Hope. Malcolm Canmore, a widower, was attracted to the beautiful Saxon princess and no doubt the prospect of an alliance with the ancient Anglo-Saxon royal house was an added attraction. Following their marriage, Malcolm lead several invasions into Northumberland in support of his brother-in-law's claims to the English throne, which achieved little and culminated in the King of Scots having to pay homage to the Conqueror. William demanded assurance of this treaty by taking Malcolm's eldest son Donald, by his previous wife Ingibjorg, as a hostage for his compliance. Margaret was highly respected for her piety and learning and for her knowledge of continental customs gained in the court of Hungary, and came to exert a great deal of influence with her husband, who frequently sought her advice on matters of state. Margaret instigated reforms within the Celtic church, as well as developing closer ties to the larger Roman Church. Mass was changed from the many dialects of Gaelic spoken throughout Scotland to Latin. The Queen became a patroness of the célidé, Scottish Christian hermits, and introduced Benedictine monks to Scotland. She was instrumental in the adoption of English-style feudalism in Scotland. Famed for her charity, Margaret frequently visited and cared for the sick, and had hostels constructed for the poor. At Advent and Lent, she held feasts for as many as three hundred commoners. The Queen reformed the manners of the Scottish court. Under her influence, ceremonies became more elaborate; tapestries came to adorn the walls; gold and silver dishes were used and court costumes were marked by the appearance of fur, velvet, and jewelry. Hostilities with England broke out again in the reign of William the Conqueror's son and succesor William Rufus. On 13th November, 1093, Malcolm was killed at the The Battle of Alnwick, his eldest son by Margaret, Edward, was also slain. The throne of Scotland was seized by Malcolm's brother Donald Bane. The disastrous news of her husband and eldest son's death was carried to Queen Margaret at Edinburgh Castle, the Queen was already mortally ill and the castle was under siege by her brother-in-law. She died three days later. While Margaret's body still lay within, Donald Bane and his ally the King of Norway besieged the Edinburgh Castle. Margaret's sons and her attendants managed to escape by a postern called the West Yhet, taking the body with them. A thick mist hid obscured them from the enemy's sight. They arrived at Dunfermline, where they buried Margaret, according to her own wishes, at Dunfermline Abbey. Her descendant, King Alexander II, petitioned Pope Innocent IV to canonize his devout ancestress. By Papal Bull of 1249 she was formally declared a saint in the Catholic church. On 19th June, 1250, her body and that of her spouse, Malcolm III, were exhumed and removed to a magnificent shrine. 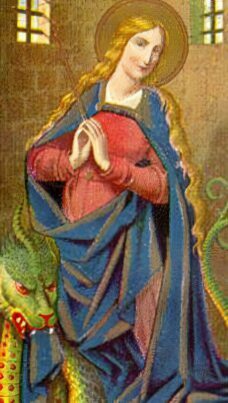 19th June was thereafter celebrated in Scotland as the feast of St. Margaret. Her remains, along with those of her husband, were not allowed to rest in peace however. In 1560 St. Margaret's shrine was desecrated by Scots Calvinist iconoclasts. Mary, Queen of Scots had St. Margaret's head removed as a reliquary to Edinburgh Castle, as she hoped to call on the assistance of the saint in childbirth. In 1597 Margaret's earthly peregrinations continued, when her head was taken home by a pivate gentleman, it then embarked upon further journeyings, arriving in Antwerp and finally reaching the Scot's College at Douai, France. It disappeared completely during the French Revolution. Phillip II of Spain had the remains of Margaret and Malcolm Canmore translated to a shrine at El Escorial, seat of the Catholic Kings of Spain. Four of Margaret's sons were to become Kings of Scotland, while her eldest daughter, Edith of Scotland, through her marriage to William the Conqueror's youngest son Henry I, was to become Queen Consort of England and following the example of her mother, came to be respected for her acts of piety and charity. 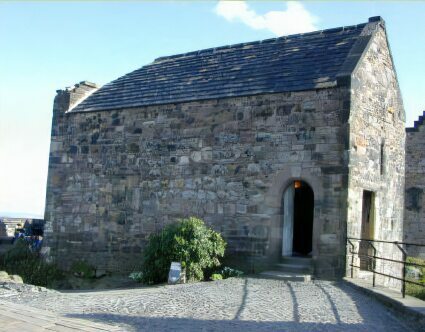 Her youngest son, King David I, who was said to revere his mother, honoured her memory by building St. Margaret's Chapel at Edinburgh Castle (pictured right) on the spot where his mother died in 1093. The Chapel is the oldest building to survive in the Castle to the present day.